The new Laurentian University Permafrost course (GEOG4256) went well and was well attended, with 41 people registered in the class. Full time undergraduate students in the group were from a wide range of programs including Geography, Education, Environmental Sciences, Environmental Studies, Outdoor Adventure Leadership, Chemistry, Archeology, and Sports and Physical Education. A few mature students also joined the course, including people who have been involved in mining and reclamation work through careers in consulting, engineering, or geological techniques. Everyone has been working hard to learn the basic principles that control ground thermal regime, ground ice formation, and how permafrost responds to changes in surface conditions. The course was interspersed with hands-on exercises, opportunities for lab work, and assignments aiming to familiarize students with basic tools for data analyses of ground thermal regimes or back of the envelope estimations of thaw and frost penetration in the ground. The equipment and facilities used were funded by Goodman School of Mines, who have been supporting efforts to develop a training program in permafrost science at Laurentian University. 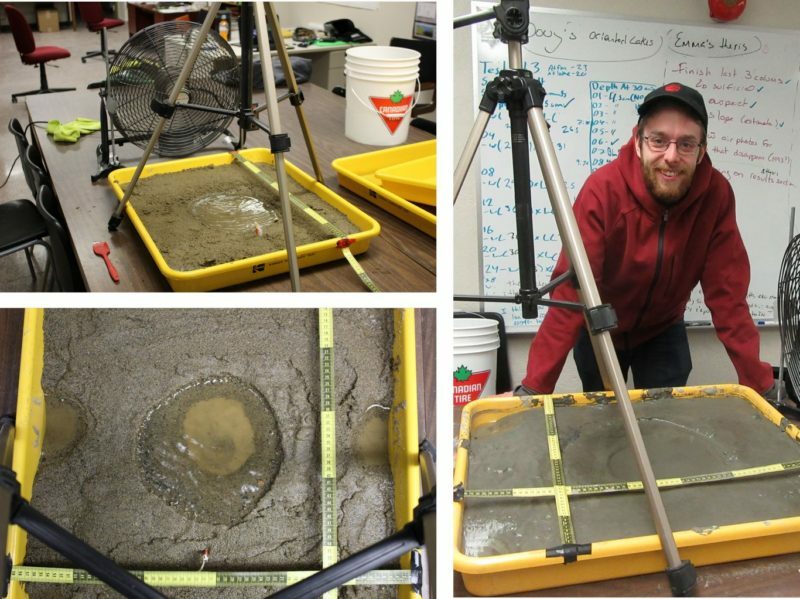 Left to right: Liam prepares buckets of saturated sand for freezing; Brandon and Chris assemble a frost tube, and Justin prepares small samples of silt and clay for texture analysis. 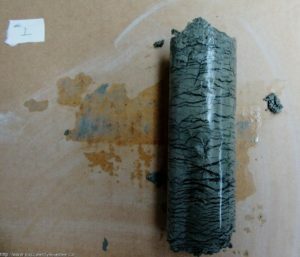 the integration of permafrost in the K-12 school curriculum. Some of these projects, involved the use of GIS, remotely sensed imagery, or numerical modelling. Others included the development of scale models and experiments in the permafrost laboratory. Finally, some of the students from the Education program produced recommendations for the integration of permafrost-related topics in the Ontario K-12 curriculum, which will help train the next generation of Canadian permafrost scientists! Josh and Emma (left) are launching data loggers to monitor ground surface temperatures and Doug (right) adjusts the water table in his scale model of oriented lakes. Belt (thanks to Etienne Perrault for shipping a bucket of it our way!) has yielded the best results so far. PVC pipes are filled with clay and are placed over a thick layer of wet sand in our freezer. Everything is carefully insulated to insure that frost penetration occurs from the top down, et… voilà!